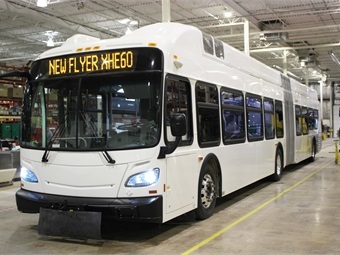 New Flyer of America, a subsidiary of New Flyer Industries Inc., conducted the inaugural road demonstration of the Xcelsior® XHE60 heavy-duty articulated fuel-cell transit bus. Representatives from two major transit authorities - Alameda County Transit (AC Transit) of Oakland, Calif., and Metro Transit of Minneapolis, participated in the vehicle’s debut and demonstration. Based on its Buy America-compliant and proven Xcelsior® X60 heavy-duty transit bus platform, New Flyer partnered with Ballard Power Systems Inc. and Siemens to develop the propulsion system. The bus will be operated in revenue service by AC Transit for 22 months following the completion of a comprehensive evaluation at the FTA’s Altoona test facility. New Flyer intends to offer these green hydrogen fuel-cell-electric 60-foot buses to customers throughout the U.S. and Canada, following this process. The propulsion system includes a combination of batteries, a fuel cell and hydrogen storage that allows the fuel cell to operate at a relative steady-state, while the batteries capture both braking energy and provide power for bus acceleration. Ballard Power Systems is supplying its nextgeneration fuel-cell power plant that is smaller, lighter and less expensive than existing models. The bus is targeted to have a range greater than 250 miles without refueling or recharging. New Flyer is the sub-recipient of a Federal Transit Administration (FTA) Grant administered by CALSTART, a non-profit organization that is focuses on clean air technology commercialization with business, fleets, and government. The FTA’s National Fuel Cell Bus Program is a cooperative initiative between government and industry to advance the commercialization of fuel cell technology in U.S. transit buses. The goals of the program include facilitating the development of commercially-viable fuel-cell bus technologies, improving transit bus efficiency and reducing petroleum consumption, and reducing transit bus emissions. “The New Flyer XHE60 fuel cell bus is truly a first of kind in the zero-emissions class of vehicles”, noted Paul Smith, Executive Vice President of Sales and Marketing. “With potential loading of over 120 passengers, this zero emissions 60-foot articulated fuel cell bus offers tremendous greenhouse gas (GHG) and emissions reductions, with the operational capabilities of no other transit vehicle in the world. We are proud of what our engineers and partner suppliers have accomplished, and thank the FTA for their active sponsorship of this next generation program”.